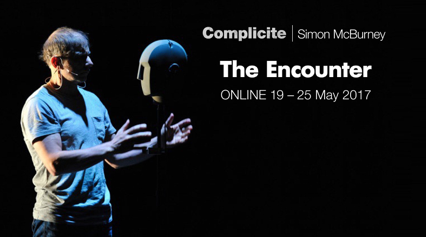 We are delighted to be partnering with Complicité to broadcast The Encounter online. The show, described as ‘a tour de force’ by Financial Times and ‘one of the most fully-immersive theatre pieces ever created’ by New York Times played a sold out run at London’s Barbican theatre in 2016, but from Friday 19 May at 7pm to the 25th May, the show will be available online and you can watch it on the link below! The Encounter has received a raft of five star reviews since its premiere in 2015 and is the winner of the Herald Angel Award for Best Production, Knights of Illumination Award for Projection, Evening Standard Award for Best Design, The Stage Award for Innovation and the 2017 Special Tony Award for Sound Design. The Encounter tells the story of National Geographic photographer Loren McIntyre who, in 1969, became lost in a remote part of the Brazilian rainforest while searching for the Mayoruna people. His encounter was to test his perception of the world, bringing the limits of human consciousness into startling focus. Threading scenes of his own life with details of McIntyre’s journey, Simon McBurney incorporates objects and sound effects into this solo performance to evoke the depths of the Amazon rainforest. The show’s ground-breaking binaural sound design (3D audio) by Olivier Award winner, Gareth Fry, is transmitted to the audience through headphones and plugs into the power of the imagination, questioning our perceptions of time and our own consciousness. Audiences must wear headphones to watch The Encounter online, or the effect of the binaural recording will be lost. Any headphones will work, but playing the film out of speakers will not give the same effect. We hope you enjoy it as much as we do!